The Bloggy Giveaways Carnival is back! Woo Hoo! There will probably be a thousand giveaways this time - amazing, huh? Once again, I felt it necessary to give away chocolatey things - how could I not? This time, there are 2 prizes to be randomly given away to my commenters. This giveaway is only open to US Residents. It is open to both bloggers and non-bloggers. The giveaway will be open until Saturday night 1/31. I will randomly choose winners from the comments and will announce them on Monday 2/2. I will e-mail the winners; if I don't hear back in 4 days, I will draw new winners. - Leave a comment on this post telling me the name of your favorite chocolate dessert. - Subscribe to my blog and leave a comment to let me know (or tell me that you already do). - Let others know about my blog (by e-mail, twitter, facebook, stumbleupon, posting about it, linking to it, etc.) and leave me a comment to let me know. Have fun! Be sure to head on over to Bloggy Giveaways! If you're interested in a drawing for a Weight Watcher's Cookbook, stop by my other blog to enter. I love that mug! Must have mug. So do I have to leave separate comments for everything or will you remember to put my name in the hat 5 times I mean 3 times.Cause #1 I'm commenting, #2 I'm going to scream from the mountaintops about your blog in facebook,#3 I already follow your blog but will subscribe just to get another chance LOL. #4 I'm the first commenter, #5 I just made you laugh! Love you my friend. I need to get my giveaway up and running here soon. #6 I just noticed I'm your top commenter! LOL. Are you laughing yet? I'd love to win your chocolate goodies. :) My favorite chocolate dessert is plain ol' brownies! I'm already subscribed to your feed on bloglines. Thanks! My favorite chocolate dessert right now (it changes depending on mood) would have to be the yummy triple chocolate peanut butter cake i made last night! Is anythign better than Chocolate and PB mixed toegther...i think not much! Oooh, I forgot - chocolate cake, hands down (with chocolate icing) and in second no bake cookies! My favorite chocolate dessert is from a bakery around here...it's chocolate mousse cake and makes your heart almost stop, it's so thick and delicious! hmm, i haven't had it in YEARS... like maybe 15 or so, but my mom used to work at a restaturant that had White Chocolate Mousse and OH it was just pure heaven in a glass! other than that, the tirimasu we had while in Ireland was TO DIE for! oh my mouth is watering. I love all chocolate! I think my very favorite are brownies. I could eat a whole pan! Chocolate banana cheesecake. Oh it is delicious.!! Yum! My favorite chocolate dessert is brownies, with walnuts! Sooo good! Hi, I found you through bloggy giveaways and love your prize so had to enter. I favorite chocolate desert is chocolate mouse mixed with rum on a bed of sponge cake with fresh whipped cream on top. I have no idea what it is called but damn its good. My favorite is "Death by Chocolate". It is layered in a glass bowl. First layer is broken up brownies sprinkled with Kahlua. Second layer is chocolate moouse. Third layer is broken up Heath bars. Fourth layer is whipped cream. Repeat layers ending with whipped cream. Sprinkle chocolate shavings on top. I love anything chocolate but my favorite is chocolate with raspberries. My favorite chocolate dessert is this really rich chocolate cake with chocolate mousse filling and chocolate ganache frosting that I've cobbled together from several recipes. I think I'm going to make it for Valentine's day! Oooh that mug is so pretty! 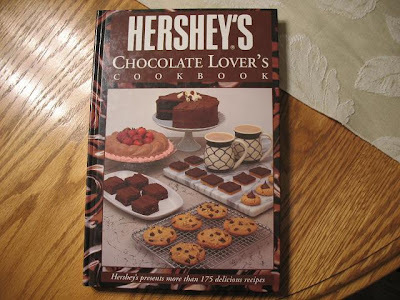 I love hot cocoa too, and that cookbook looks like so much fun. Thanks! I love chocolate covered strawberries, chocolate molten lava cake, and chocolate mousse. I just subscribed to your feed via Yahoo reader also. I am not big on super chocolaty things, however, Symphony Brownies are amazing! That is, brownies with pieces of Symphony chocolate bar in them. Your page looks yummy. One of my favorite chocolate desserts is chocolate mousse pie. I love chocolate cake. A littl e boring but delish! I love chocolate coconut cake! Although I do love anything chocolate in general :) Thanks for entering me! I simply cannot resist a fudge brownie! my fave chocolately dessert is simple but its also a classic, smores. Your blog header is making me drool! One of my favorite chocolate desserts are brownies with ice cream and chocolate sauce on top...mmmm! My favorite chocolate dessert is and will always be fudge! I could eat it all year round! My favorite chocolate dessert is chocolate mousse (?sp). I found you thru the carnival - love, love your site - will definitely be back . Holy smokes how I love chocolate. I think my favorite chocolate dessert is white chocolate chip brownies. SO delicious! I also adore some fresh fudge. I love anything high end chocolate. My favorite chocolate dessert is a nice German Chocolate Cake. I love chocolate cake that is fudgy. I looove chocolate chip cookies waay too much; especially right out of the oven. :9 Thank you for offering this giveaway! It is called, "Better than s*x"
I like them all..I love german chocolate cake! I love my mom's German chocolate cake! This is such a fun giveaway! I would love to win! Thanks! I made cupcakes that were to die for a few years back. Devils food cupcakes, with FABULOUS chocolate buttercream frosting...and filled with a cream frosting. Soooo good! My favorite is assorted chocolates which I look forward to every Valentine's Day. I like making home made fudge or chocolate mousse! This is tough, but my fave chocolate dessert is any variation of chocolate cake! Mmmmm, chocolate turtles are delish! I love Chocolate Cream Cheese Brownies. Yummy. What a super giveaway. I like all things chocolate, but my favorite is a chocolate bundt cake with a dark chocolate ganache. So good and simple. Oh, and a bit of whip cream doesn't hurt! THanks. My favorite chocolate dessert.. Hmmm... I'd have to say... Fondue... I love dipping and sharing!! I'm a chocolate lover. German Chocolate Cake is one of my favorites. Thanks. I just sent an email to one of my friends to visit your giveaway. Love, love, love chocolate. Molten lava cakes are probably my very favorite - yummy, gooey, goodness! My favorite dessert is definitely chocolate cheesecake with caramel topping or raspberry topping. Thanks for the opportunity! I love all things chocolate! I think my fave is German Choclate cake!! Awesome giveaway! I LOVE chocolate mousse! Chucky chocolate chip cookies are the BEST!! I love chocolate covered strawberries. Thanks for the chance. I'm a sucker for a gooey brownie...But to be honest, I'm a sucker for chocolate. Period. LOL! I love Mississippi mud cake! What a delicious giveaway! My favorite chocolate dessert is German Chocolate Cake.. my grandma makes it the best! My favorite chocolate dessert is Mississippi Mud Cake.......oh so good! My favorite dessert is Baked Chocolate Pudding. My grandmother taught me how to make it. thanks ! hope i win ! my fave choc dessert has to be triple chocolate cheesecake! Oh my gosh! That mug! I love that mug. It is divine! Anything with dark chocolate for me. A nice, rich, moist, not too sweet, chocolate cake with ganache. AAHHH!!! My favorite chocolate treat has to be chocolate covered pretzels. Thanks so much for the giveaway!! My favorite would be Chocolate Silk Pie. Yummmmm! My favorite chocolate treat are truffles. Honestly, anything chocolate is my favorite. Unless it has whole chunks of fruit in it or something. HOWEVER, chocolate dipped strawberries are pretty darned good. My favorite is white chocolate cheesecake! I love chocolate dipped fruit. I also love chocolate pie, and brownies, of course. I haved subscribed via Google Reader. I love anything chocolate, but my all time fave is Italian Love Cake ~ Sooooo Yummy !! My favorite chocolate dessert is chocolate kiss peanut butter cookies. the chocolate is called Death by Chocolate..
the non chocolate is pea pickin cake.. I love this reeses cake, it is nothing but peanut butter and chocolate and it is so good. Just thinking about it makes me want a piece. I love yellow cake with chocolate frosting! Um...chocolate is dessert! I don't need anything fancy! :) But chocolate cake is good! I think hot chocolate counts as a dessert, don't you? :-D I add in a little peppermint extract and it's perfect! I am surprised I have time to comment on this after reading all the comments before mine. I don't know how I missed the give-a-way yesterday when I read your blog. I think I just was so excited about your chocolate goodies that I didn't finish reading. I wanted to know what everyone likes. My favorite has always been the peanut butter chocolate kiss cookies. I think because my favorite candy is Kisses. They make them in so many different ways now like almonds, dark, hot cocoa and many more that I just can't get enough. I am already a subscriber and am so happy to be so. I will also promote this wonderful blessing of chocolate on my FB. Your blog makes me almost smell chocolate and my mouth waters and I get shivers. I think I even gain a pound every day just reading it. My favorite chocolate dessert is See's chocolate raspberry truffles! What great giveaways! I love the mug! My favorite dessert: chocolate covered strawberries. I'm so hungry for them right now...I may just have to make some soon! I am simple, i love a good brownie and vanilla ice cream! I love the mug- really, really love the mug. Great giveaway, thanks. Fannie Mae Pixies. Thanks for the giveaway!! homemade chocolate chip cookies are fantastic! I'd love to win this for my SIL in Michigan. my fav (being from NY), there's a bakery in the city that is a special occassion treat, but we always get a piece of triple chocolate mousse cake...it's got a cake layer, mousse layer then covered all over with a chocolate ganache...you have that with a cup of cappaccino and you're in HEAVEN I tell ya!! Turtle cake... Mmm.. Thanks for the giveaway! Count me in. I'm shorting out my keyboard by salivating on it! My favorite chocolate is any chocolate that I get as a surprise. What a Great looking page of chocolate ! My favorite chocolate dessert is Triple Chocolate Cheesecake from Atlanta Bread Company. Chocolate crust,chocolate cheesecake and chocolate drizzle on top. Brownies are my favorite chocolate dessert, especially warm right out of the oven! My favorite chocolate treat is Triple Fudge Brownie Ice Cream - topped with Hershey's syrup, of course! And, I have to say that your blog made my mouth water and now I'm going to have to go in search of some chocolate! Thank you for this giveaway! Chocolate in general is so good! Especially if you add peanut butter! Hmmm... picking your favorite chocolate dessert is a little like picking your favorite child, isn't it? If I HAD to choose... it would probably have to do with oreos and ice cream (like an oreo ice cream pie)! 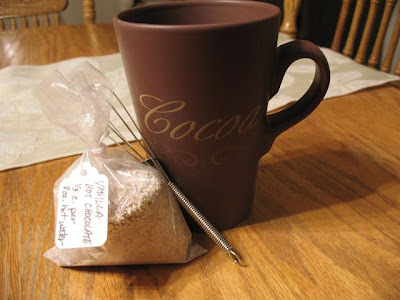 And great minds think alike... check out my hot chocolate give-away! My favorite chocolate dessert is chocolate Diet Coke cupcakes! cheesecake truffles are so yummy. Thanks katie_mmartin at yahoo dot com. A long time ago, TGIFridays had Oreo Madness. It was my true favorite. I need to recreate it! Thanks for the giveaway! i love the Better than (you know what) cake. What wonderful giveaways! My favorite chocolate dessert...ooey, gooey brownies! So yummy! Freshly made devil dog with real whipped cream.Thanks for the great giveaway! GREAT GIVEWAY! I LOVE BROWNIES! Favorite chocolate dessert (are there other types of desserts? ): chocolate pudding pie! I subscibe to your feed through google reader. I really like plain dark chocolate. I love to savor it. It's so hard to pick just one favorite dessert! I really like a chocolate marble cheesecake- yum! Vanilla ice cream with brownies! My favorite chocolate dessert is brownies with nuts. Thanks for the giveaway! My favorite chocolate dessert is blonde brownies drizzled with white chocolate. Chocolate molten lava cake....yummy and oozing chocolate makes me hungry for some right now. Thank you for being part of the Bloggy giveaway. We all appreciate it. I just subscribed by e-mail. chocolate fudge ice cream! I would love to win this, thanks! My favorite chocolate dessert is brownies made with chocolate chips and covered in real fudge frosting. Oh, they are so decadent and so good! Although I love almost everything chocolate, I do just adore chocolate mousse! I must admit "Almond Joy" is my weakness, lol. My fave choc dessert is Coffee Ice Cream Fudge Cake which you can find online at allrecipes.com! Mmmm, chocolate mousse. Thanks for a super giveaway! Death by Chocolate - lots of brownies, chocolate candy, and chocolate pudding. I love brownies-any kind of brownies! Gooey, slightly undercooked brownies for me, please! Extra chips are a plus. Mud pie with a thick layer of chocolate in the bottom. Any chocolates are the best though! Brownies are my favorite! Thanks for the giveaway! HOW had I not seen this post. OK... favorite chocolate dessert... that's so hard. I'd have to say brownies... but not from a box. Only my own homemade from scratch ones will do. My favorite chocolate dessert is Chocolate Cheesecake! Actually, I love anything with chocolate in it! Thanks for the giveaway! Thanks for the yummy giveaway! My favorite chocolate dessert is cherry chocolate brownies! Thanks! Almost anything chocolate is good for me. I like rich brownies and moist cake. But a nice, dense cheesecake is good too!